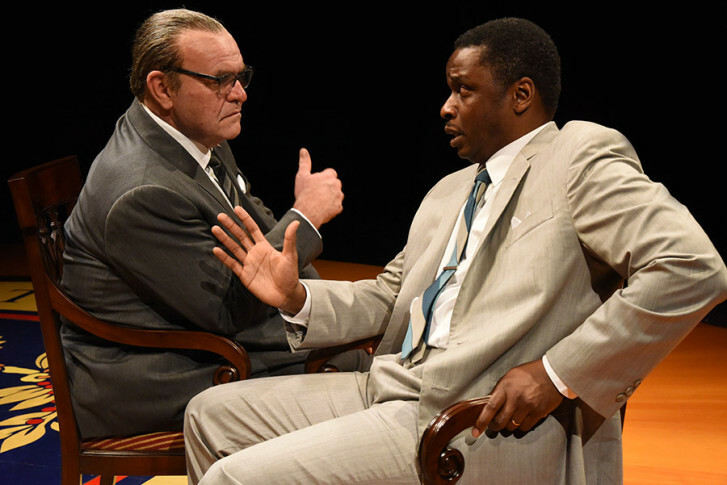 Bowman Wright discusses his role as Martin Luther King Jr. in "All the Way" at Arena Stage. WASHINGTON — After retiring his iconic role of Walter White in TV’s “Breaking Bad” (2008-2013), Bryan Cranston could have chosen to play any role. But he chose to play former President Lyndon B. Johnson in Broadway’s “All the Way,” winning the Tony for Best Performance by a Leading Actor in a Play while the show itself won Best Play. The choice says a lot about the enduring power of one of America’s most influential presidents, whose early presidency is currently on display at Arena Stage now through May 8. Written by Robert Schenkkan, “All the Way” borrows its name from LBJ’s 1964 campaign slogan — “All the Way with LBJ” — and follows his efforts to pass the Civil Rights Act of 1964. “I believe he was a wonderful president. He had his faults — Vietnam is what really killed him — but outside of that, this man really did care,” said actor Bowman Wright, who plays Dr. Martin Luther King Jr., the biggest driver in getting LBJ to pass the civil rights bill. The show stars Jack Willis, who originated the role in 2012 at the Oregon Shakespeare Festival before director Bill Rauch took it to Broadway in March 2014, winning the Tony for Best Play. “The guy is amazing. He’s amazing to watch. He’s amazing to be in the room with. He’s fluent. What’s great about it is it’s like watching a reincarnation of the man … I don’t believe he’s trying to sound or do anything like him, it’s just watching him navigate it. It’s very inspiring to watch him,” Wright said. As for Wright, this isn’t his first time playing Dr. King at Arena Stage. He previously played the civil rights legend in “Mountaintop”in 2013. Now, he reprises the role alongside talented local actress Shannon A.L. Dorsey, who plays wife Coretta Scott King. “It’s always a little weird playing him because you want to play him as a man. You don’t want to play him as the person that you think about when you watch TV, some larger-than-life figure … It’s more important for him to be seen as a man, rather than something that is not of this world,” Wright said. Still, each time he plays King, it’s a “dream” role for Wright. “To me, he’s an idol in the sense that even though he’s just a man — he’s not an angel or a saint or anything like that — but what makes him so amazing is that, him begin just a man, he took on things that were bigger than him, and he didn’t take them on to be talked about that he’s the best man in the world. He didn’t do it for bragging rights, he did it because he thought he was doing the right thing. He believed he was doing the right thing, and to me, that’s even better than an angel or a saint,” he said. Actor David Oyelowo recalled a similar challenge when playing King in the movie “Selma” (2014). “If there’s anyone you want to be in the same sentence with, it would be someone like Dr. King, so that’s something I value and treasure immensely. The job of the actor, the job of a movie being made about a real person is to bring dimension and revelation to them. … What you don’t want to do is basically have a film that gives you all the information that a documentary could. What you want to have is go behind the veil, go into the human side of the person,” Oyelowo told WTOP last year. While “Selma” earned a Best Picture nomination, it also sparked controversy for portraying LBJ (Tom Wilkinson) as dragging his feet and only begrudgingly joining King’s agenda. Several historians took issue, saying that LBJ was much more directly involved with in the fight for civil rights. While “Selma” explored the LBJ-MLK relationship leading up to the Voting Rights Act of 1965, “All the Way” explores their relationship in the run-up to the Civil Rights Act of 1964. “Right after JFK dies, we start the play … We don’t go into Selma. This play actually predates Selma, (exploring the period) right before Selma, and right after that, that’s when King goes into Selma because there’s certain things King needs to be done that haven’t been done,” Wright says. Wright notes similar political pressures on both LBJ and MLK. “King may not have been a president, but the way he was looked at and treated, was almost like he was ‘Another Kind of President of the United States.’ Some of the same things that we watch LBJ deal with his staff, you’ll see the same things on King’s side, how hard it was and the pressure he was getting, not just from civil rights (activists) but from union supporters. He was getting pressure from everybody in similar ways as LBJ … There’s a lot of similarities between the two men,” Wright said. But rather than viewing the play as history, he says it provides plenty of lessons for the present. “What the play tells us is … how important history is to the present and to the future. Frederick Douglas has this great saying that if we don’t pay attention to the past, the future is dull, our present will mean nothing. What we’ll do is repeat our history. And in this play, if we don’t pay attention to the things going on right now in our country, we will wind up back in those days,” Wright warned. What’s the antidote to a potential backslide? “Start paying attention and start listening to one another — and really listen. Just because someone is saying something you don’t agree with doesn’t make them an evil person. We need to start having conversations, actual conversations, not yelling and screaming and belittling each other on national TV or talking about each other in ways that don’t actually help us. … We’re always supposed to be growing and growing together, not growing apart,” Wright said. This unique forum for communal conversation is a big reason why Wright got into acting in the first place. Born and raised in Newark, New Jersey, he studied acting at the University of California, San Diego under the tutelage of Kyle Donnelly, who now directs him in “All the Way” at Arena Stage. “What I love about Kyle is … there is a freedom of the way you can work. And like any good director, she’ll shape and mold it until it makes sense to the whole story. She’s a great storyteller. … In grad school, we did ‘Joe Turner’s Come and Gone’ by August Wilson. I played Loomis, one of my favorite roles I played in grad school … and it’s still one of my favorite roles,” Wright said. “We performers have the responsibility of holding your attention until we have changed your consciousness,” De Shields told WTOP last year. This is the magic of Arena Stage. “You feel like you have that freedom to actually tell your truth. Not a lot of theatres really want you to do that. They want you to make sure the audience is happy with you. What the Arena wants you to do is make sure you tell the truth, and if you do that, more people will be more open to hear what you’re saying. They might not like what you say all the time, but they will respond,” Wright said.